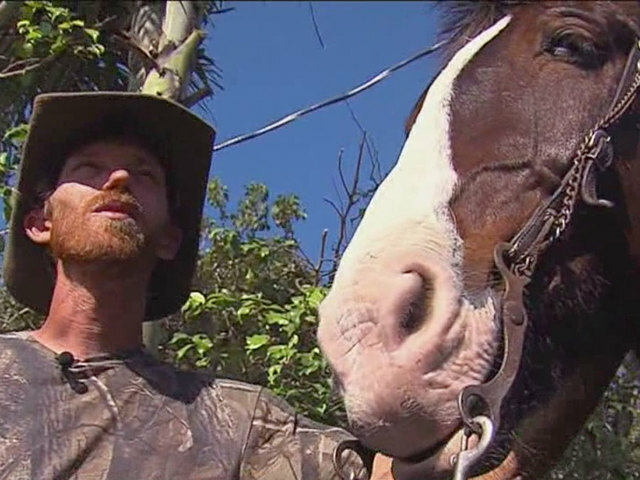 MIAMI (AP) -- Authorities say a man who was trying to ride his horse from South Carolina to Key West is facing an animal cruelty charge in South Florida. The Miami-Herald reports that 36-year-old Chris Emerson was stopped Wednesday morning by Miami-Dade police. Officials determined that Emerson's horse, Trigger, was dangerously malnourished. Laurie Waggoner runs the rescue stable where Trigger was taken. She told the Herald that a horse his size needs about 25 pounds of hay and quality grains a day. Officials say Emerson has two plastic bags stuffed with lawn trimmings for the horse to eat. Emerson told the Herald he left Greenwood, South Carolina, about five months ago. He said he decided to ride his horse to Key West after he got divorced and crashed his truck.